MAGNUS (AUS) (Bay 2002-Stud 2008). 4 wins to 1200m, AJC Galaxy H., Gr.1. Sire of 375 rnrs, 261 wnrs, 15 SW, inc. Malaguerra (BTC Cup, Gr.1), Magnifisio, Great Shot, Enbihaar, Platinum Kingdom, Magnapal, Prince of Brooklyn, Miss Promiscuity, The Alfonso, The River, Malibu Style, Volcanic Ash - Volcanic General (Mal. ), Alpha Beat, Missy Cummings, Prettyhappyaboutit, SP Streets of Avalon, Princess of Queens, Gredington, Duke of Brunswick, etc. MADEENATY (Exceed and Excel). 2 wins at 2, A$512,430, in 2016-17, Wyong Magic Millions 2YO Classic, RL, VRC Maribyrnong Trial S., L, 2d VRC Football S., L, Winter Lodge H., 3d VRC Ottawa S., Gr.3, GCTC Magic Millions 2YO Classic, RL, MVRC Ladbrokes 55 Second Challenge H., 4th ATC San Domenico S., Gr.3. Kylie's Fame. 4 wins to 1400m, A$86,295, to 2017-18, BRC Blokes Day Out P., 2d GCTC Sky Racing H., 3d Ipswich TC Sky Thoroughbred Central H., Qld Times H.
Viceroy (g. by Magnus). 6 wins. See below. Northern Storm (g. by Magnus). 6 wins to 1450m to 2016-17 in Aust. BOND STREET (Testa Rossa). 6 wins to 1200m, A$177,130, Mornington RC Hareeba S., L, MVRC Advanced Mailing Solutions H., VRC Sally Malay Sprint H., 3d MRC Moorabbin Timber H.
Jatomick. 3 wins at 1600m, 2000m, 2d AJC Ben Haswell H., Sargents Pies H., 3d AJC Henry Lawson H., HC Dangar H.
Bundaleda. 8 wins-1 at 2-to 1200m, A$94,537, TTC Blenheim Inn H., Newstead Hotel H., Shaw Contracting H., 2d TRC Tony Carrick Vase, TTC Deloraine Hotel H.
NORTHERN BISQUE (Tolomeo). 3 wins. See above. Timely Move. 3 wins-1 at 2-at 1100m, 1200m, AJC Camden Welter H., STC Greek Campaign H., Silastic Windscreens H., 2d AJC Key H., 3d AJC Saddlery H.
Gain Control. 2 wins at 1300m, STC Domain S., Londonderry H., 3d STC West City Motors H. Sire. BEACHES (Todman). 9 wins-1 at 2-to 1400m, VRC Craven A S., Gr.1, STC Theo Marks H., Gr.2, VATC Moonga H., Whittier H., Park H., Wellington H., Doveton H., VRC Flemington H., 2d VATC Toorak H., Gr.1, VRC Lightning S., Gr.2, Maribyrnong Trial S., L, 3d AJC Epsom H., Gr.1, 4th AJC Doncaster H., Gr.1, All-Aged S., Gr.1. Sire. BLETCHINGLY (Biscay). 4 wins to 1200m, AJC Galaxy H., Gr.2, VRC Moomba H., MVRC Windarra H. Champion sire. DIVINE CALLING (Stratum). 5 wins-1 at 2-from 1100m to 1600m, A$496,980, HK$4,772,500, to 2016-17, MVRC Bill Stutt S., Gr.2, WATC Scenic Blast S., L, MVRC F Vitale & Sons H., ATC TAB Number 1 Club H., HKJC Cafeteria H., 2d MRC Caulfield Guineas, Gr.1, Hong Kong Classic Mile, L, 4th ATC Kindergarten S., Gr.3. DIAL TONES (Rubiton). 5 wins at 1200m, 1400m, A$258,140, STC Winter S., L, AJC Rockdale P.
MINGLING GLANCES (Yeats). 7 wins-2 at 2-from 1200m to 1600m, A$221,440, VRC HongkongBank S., L, 2d AJC Surround S., Gr.2. Producer. BIDII BABE (Not a Single Doubt). 5 wins at 1100m, 1200m, A$318,300, to 2016-17, BRC Bright Shadow H., L, 2d Sunshine Coast Cup, L.
QUEEN'S COMMAND (Commands). 6 wins from 1600m to 1800m, R495,695, Greyville Flamboyant S., Gr.3, Clairwood Play an All to Come Bet H., 3d Clairwood East Coast H., L-twice, Scottsville Off to Stud H., L.
SHAZEE LEE (Ready's Image). 3 wins-1 at 2-at 1350m, 1400m, A$238,115, to 2016-17, Hawkesbury Guineas, Gr.3, Hawkesbury RC Provincial Championship Qualifier. SPORTIVO (Testa Rossa). 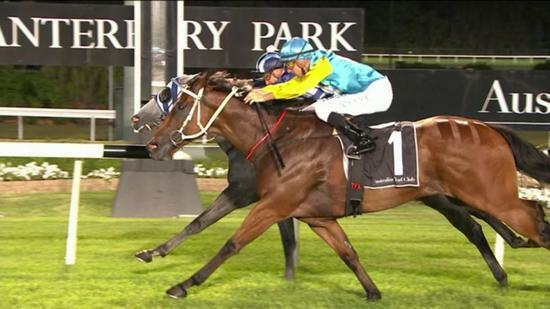 5 wins-1 at 2-from 1100m to 1600m, A$184,075, WATC Gimcrack S., L, Superior Star H. Producer. Race Record: 28 Starts 6-3-4 A$197,660. 6 wins to 1250m, A$197,660, to 2017-18, ATC Schweppes H., Boxing Day at Randwick H., Theraces H., 2d VRC Schweppes Flemingtonfling S., ATC Theraces Sprint H., 3d MVRC LF Sign Group H., ATC Evening Star H., Schweppes H., VRC Red Tempo H.